Nowadays, everyone is doing their part to tend to the environment, and Tedrick’s Roofing is no different. We proudly carry GAF’s Certified Green Roofer badge. In this post, we look at what it takes to achieve this certification. We also detail what benefits this brings to homeowners. 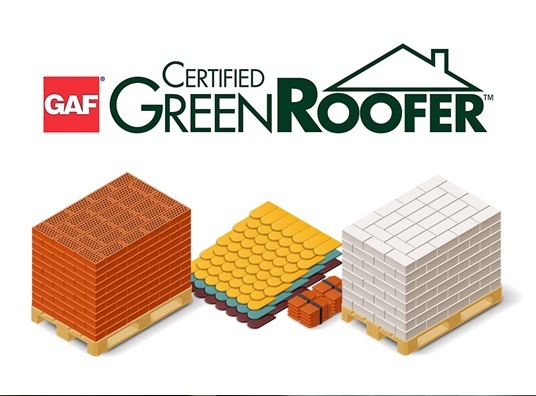 Firstly, a roofing contractor in Kent seeking Green Roofer Certification must already have earned GAF’s Master Elite® status. This ensures that we are capable and trusted installers of their products. Tedrick’s Roofing also commits to improving to overall sustainability of our roofing business. We offer shingle recycling as the main means to dispose of old roofing materials. We are also committed to carrying products that can be reused or recycled at the end of their lifespan. Another requirement is that we took an approved course on asphalt shingles and green home principles. You can be sure to get a top quality product when you work with a Certified Green Roofer. GAF carries a beautiful range of durable and reliable asphalt shingles. More than that, you contribute positively to conserving the environment. When your asphalt shingles reach the end of their service life, we’ll take them in and convert them into raw materials. These will be used to pave roads or make new shingles. A study found that the used shingles from the average American home is enough to pave over 200 feet of a two-lane highway. More than just the material for roofing, Tedrick’s Roofing also offers green and earth-friendly services, from installation to roof repair in Auburn. These also include the installation of solar-powered roof ventilation. This keeps your attic cool and stops the buildup of moisture. This also extends your roof’s service life even more. Give Tedrick’s Roofing a call today at (877) 212-9355, and we’ll be more than happy to further detail the benefits of hiring us for your next roof project.